I don’t eat much ham as it’s an over-processed food. Yet, it is an Easter (and for some, a Christmas) tradition, and sometimes that tradition means leftovers. 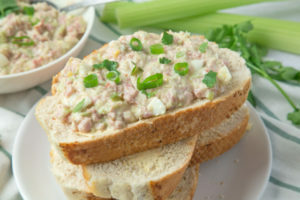 After sending some home with family, I turn the leftovers into ham salad. Unfortunately, in my area, Lancaster County, Pennsylvania, many homemade and store recipes call for hard-boiled eggs, and refined sugar. Eggs I can handle, but more sugar in my diet? No thank you. Here’s a simple and delicious recipe for homemade ham salad that drops both of those ingredients. Sweet pickle relish and sweet onion will give you the sweetness your palate craves. Enjoy! But be advised: this recipe is not Paleo. 1/4 Cup Pickle Relish, your choice sweet, dill, or spicy. I use sweet. Serve on your choice of bread (or wrap in large lettuce leaves) with your choice of topping. I like simple lettuce and tomato.